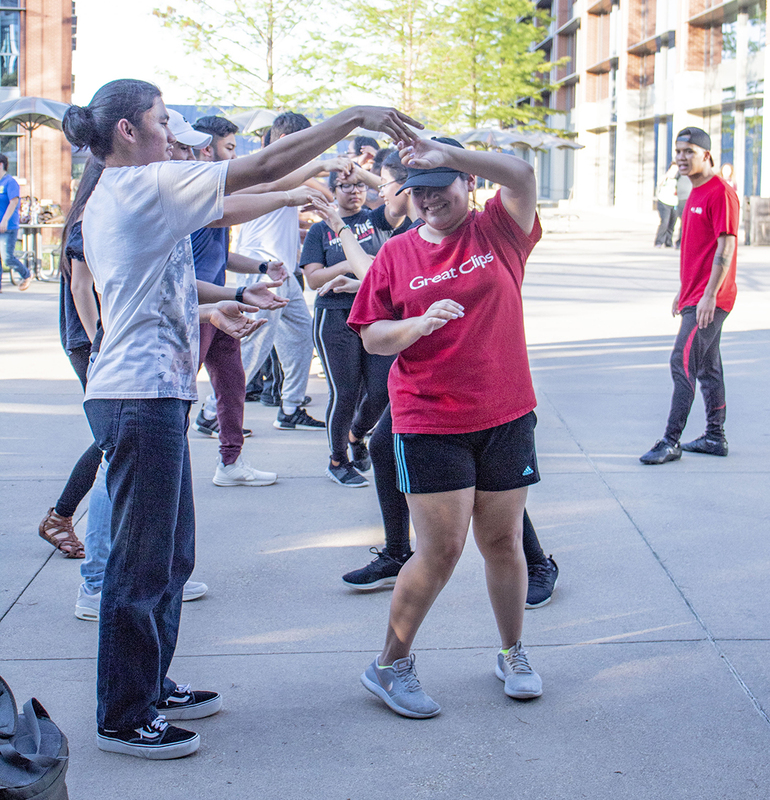 About 50 aspiring dancers assembled Sept. 19 in the TR Campus courtyard to learn the basic moves of salsa dancing in an event dubbed Noche de Salsa. Despite the sweaty, 92-degree conditions, 44 students, three staff members and one faculty member met at 5:30 p.m., first to partake in a free enchilada dinner before beginning the dance lesson. “I’m very excited for this to get started,” said Cortney Walden, a TR student development associate. The participating dancers formed three lines across the courtyard in front of their instructors, Camilo Moreno and Jessica Mejias, who then began teaching the fundamental salsa dance steps. TR student Maria del Carmen Granados practices a spin move with her dance partner during the event Sept. 19 on TR Campus. Moreno, who hails from Colombia, and Mejias, originally from Venezuela, are from the Calirumba Dance Company, a group that has been used by TCC for three years, according to TR student development associate Jacklynn Green. “We have both been dancing from the age of 5,” Moreno said of himself and Mejias. Since salsa music is designed to be danced to by two partners, it lends itself to encouraging students to meet and make new friends. TR student Jamal Dillon, who attended last year’s Noche de Salsa event, said this year’s turnout was much larger. During Noche de Salsa, the novice dancers easily engaged one another, leaving many with big smiles on their faces as they tried to coordinate with their instructors.